We get through buckets of mayonnaise in this house. I kinda like it – particularly with store-bought pizza for reasons I don’t understand – but the rest of the family demolish it. If my son was asked the legendary question: “you’re handed a sausage sandwich. 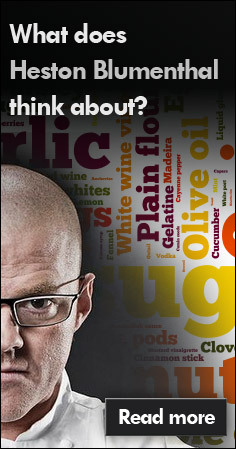 Will it be red sauce, brown sauce, or no sauce at all?” he’d reply mayonnaise in a heartbeat. So to receive some samples from Hellman’s of their flavoured mayonnaises was set upon by the family quite quickly. First the packaging – there’s much made on TV of their no-mess resealing cap. And sure enough it works a treat. As long as you don’t mind sacrificing a third of the bottle. By the time you work your way down there the rest refuses to come out. I took a knife to it to free the captive condiment. But what about the taste? There was a black pepper one which I found nice and prickly, and worked really well in a ham salad wrap. But the garlic one was disappointing – slightly tangy but not flavoured with garlic at all. So that’s why it ended up in this gratin. 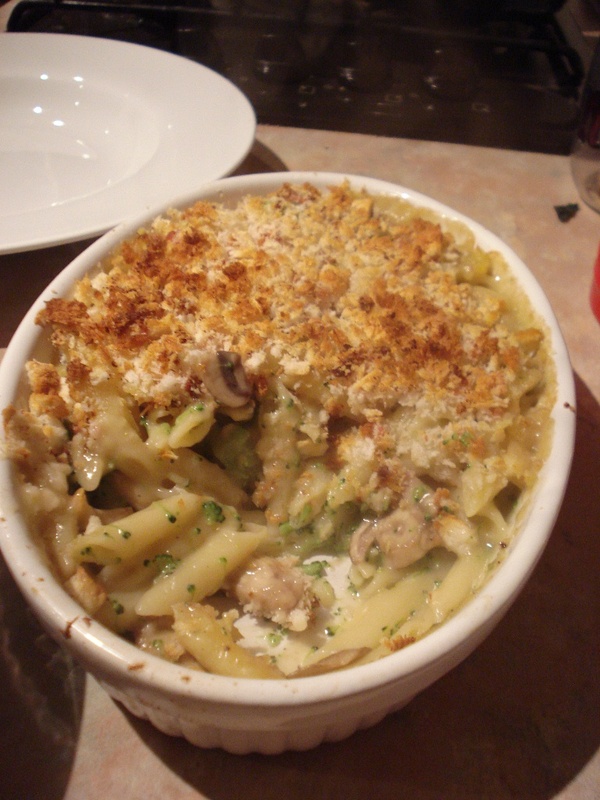 This type of recipe works great as a side dish, or can be had with a simple salad on the side. Preheat the grill to high. Get a large pan of salted water on to boil and add the potatoes. Simmer for 10 minutes or until just tender. While the potatoes cook, fry the onions and bacon in a pan with a little oil until the bacon has coloured and onions softening. Drain the potatoes and add to the onion and bacon pan, seasoning as you go. 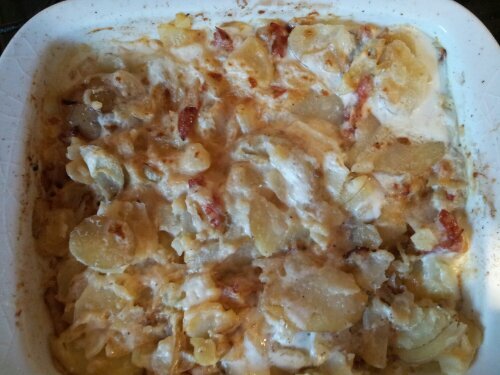 In a shallow dish mix the mayonnaise with a little milk until you get a creamy dressing, and then stir the onion, bacon and potatoes through it until well coated. Grate a little parmesan over the top and put under the grill until golden. 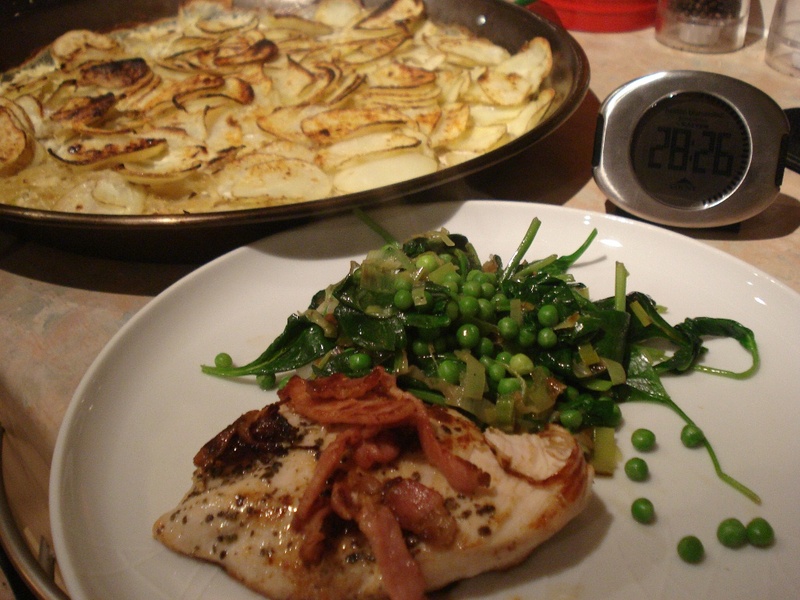 This entry was posted in bacon, food, mayonnaise, onion, potatoes on May 4, 2013 by Gary. I love the Great British Menu. There’s plenty wrong with it – enforced friction between the chefs, pointless “out and about” sections, and we all know it should be 1 x 1 hour show a week but the chance to see the top tier of British chefs cooking their guts out is always fascinating. This year’s show has a Comic Relief theme. One chef was new to my radar this year, Mary-Ellen McTague. A Fat Duck graduate, her influences were clear to see. I found her bath of beans particularly amusing, and am sad to see it won’t feature at the final banquet. 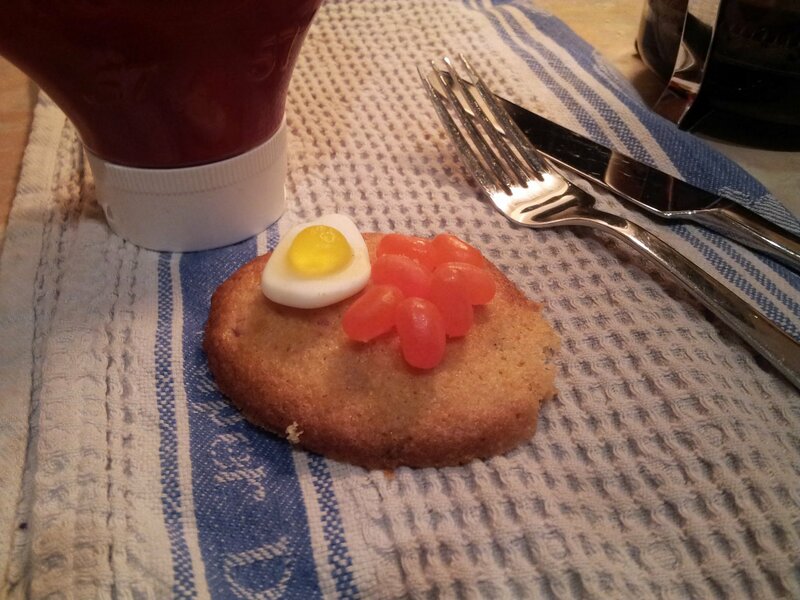 When Sainsbury’s asked me to come up with a Red Nose Day cookie, this playful starter was at the forefront of my mind. 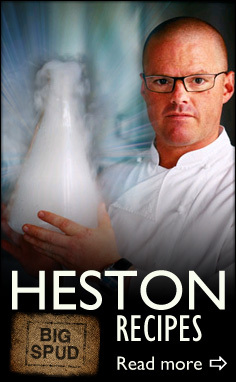 Picking up a recipe for “bacon and banana cookies” from her mentor’s book Heston Blumenthal at Home the idea of a play on a Full English was there. Topped with sweets this is a silly biscuit – that’s the point – but the bacon element is genuinely interesting. Go for a sweet cure bacon and it’s not so jarring, but it’s really worth a go. Preheat the oven to 190°C. Line a baking tray with baking paper and lay the bacon on top. Bake for 10 minutes, then pat dry with kitchen paper. When cool cut into tiny pieces. Cream the butter and sugar together until light and fluffy. Sift in the flour, baking powder and soda with a pinch of salt until mix until a smooth dough is formed. Mix in 1 egg at a time, then stir in the bacon pieces. On a greased tray spoon out small blobs 10cm apart and bake for 8 – 10mins or until the the cookies are browned. As soon as they are out of the oven press a fried egg and a few jelly beans into the surface to melt in. Leave to firm up on the tray for a couple of minutes then transfer to a cooling rack. This entry was posted in bacon, cookies, food, jelly beans, sweets and tagged heston blumenthal, Mary-Ellen McTague on February 24, 2013 by Gary. In another one of my recipes for students, I’ve taken inspiration from the wonderful Ottolenghi. In his latest book (Jerusalem by Yotam Ottolenghi and Sami Tamimi (Ebury Press, £27)) he and long-time collaborator Sami Tamimi return to their home town of Jerusalem to reminisce on the food gems of their youth. 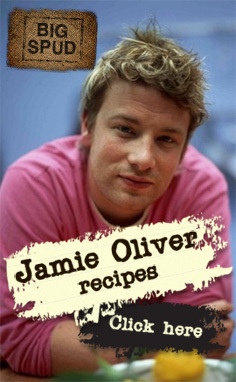 It’s full of wonderful recipes and ideas, and generally speaking most of the recipes are thrifty and homely in nature. For the meatballs, combine all the ingredients in a bowl and mix well with a pinch of salt. With damp hands form into chunks the size of golf balls. Heat a large frying pan over a medium heat with a little oil, and a normal saucepan over a high heat with a little oil. Add the meatballs to the large pan and brown them on all sides for about 7 – 10 minutes. You should do this in batches if this is going to crowd the pan. Meanwhile in the other pan crush in the garlic and then immediately add the tomatoes. This will spatter and bubble so watch out. Add a pinch each of salt, sugar and pepper. You should continue to simmer this sauce until when you draw a wooden spoon through it leaves a channel, so it is thick and rich. At this point tip the meatballs into the sauce and cook for a couple more minutes to cook through. 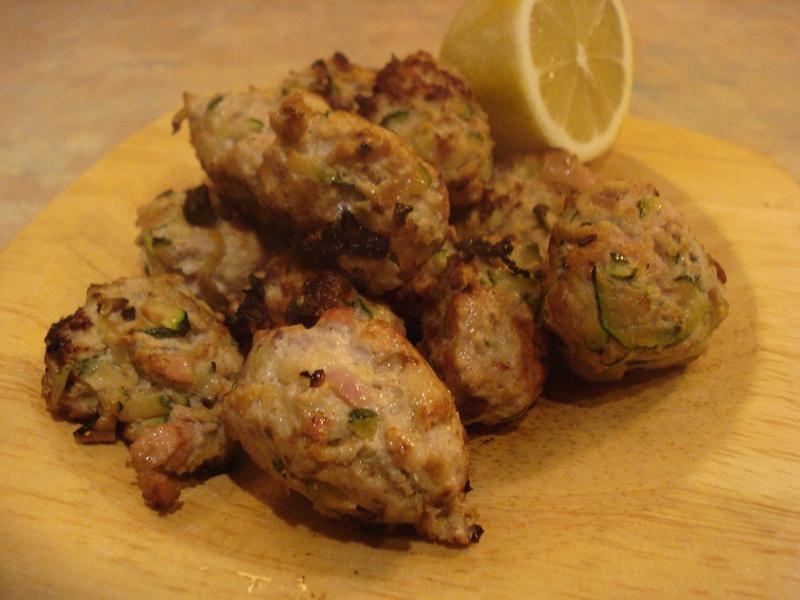 This entry was posted in bacon, courgettes, food, lemon, turkey and tagged yotam ottolenghi on October 8, 2012 by Gary. I seem to be writing about nothing but pizzas at the moment. I don’t know what it is but I can’t stop craving that perfect mix of bread, cheese and tomato. 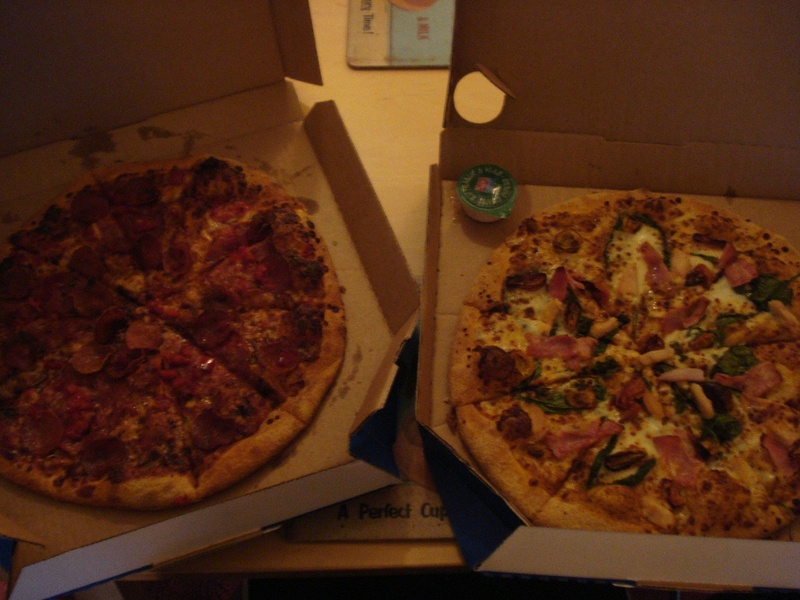 What luck then, that Domino’s invited me to try their Gourmet range of take away pizza. I’m so-so on Domino’s pizzas usually, I find their bases a bit blandy and bready, instead of puffy and yeasty as I like them. The base can be so easily overlooked but it for me it should definitely be the star of a pizza. But if they’re paying I’ll give it a go. Armed with a group of friends, we tried out their Firenze and Rustica pizzas, and a bunch of sides. The ordering system is inventive, with an online order tracker with automatic post-back (one for the jQuery fans) that updates onscreen as to what your pizza is up to at any time. This probably works really well when you’re having a delivery, but if you’re collecting there is nowhere to be told when you should turn up for it. We just pot-lucked it in the end; had we not we’d probably still be staring at the screen. The Firenze is topped with salami, pepperoni and peppers, upon which my chum demanded extra chillies. I ordered the Rustica for me which boasts chicken, bacon, spinach and SunBlush tomatoes. The spicy pizza went down with my friends really well, just what they were after. The Rustica was perfectly OK, just a very ordinary takeaway pizza. The base was certainly a lot better than I remember, with a bit of stretch to it, and the spinach was a nice touch. As for the sides, the garlic mozzarella sticks were great (they’re fried cheese; how can you go wrong?) but the chicken wings were abysmal: little sweaty things that tasted only of that chemical heat you get that flashes hot then disappears immediately. Furthermore it cost a small fortune. One of these Gourmet pizzas costs £16.99 which is no small figure for something which has a relatively tiny base cost. I haven’t a clue where your money is going. I was inspired to beat them at their own game. I had one of Warburton’s square naans to hand and they are sensational on their own; mildly spiced, excellent texture and just enough crunch (Atul Kocchar loves them!). 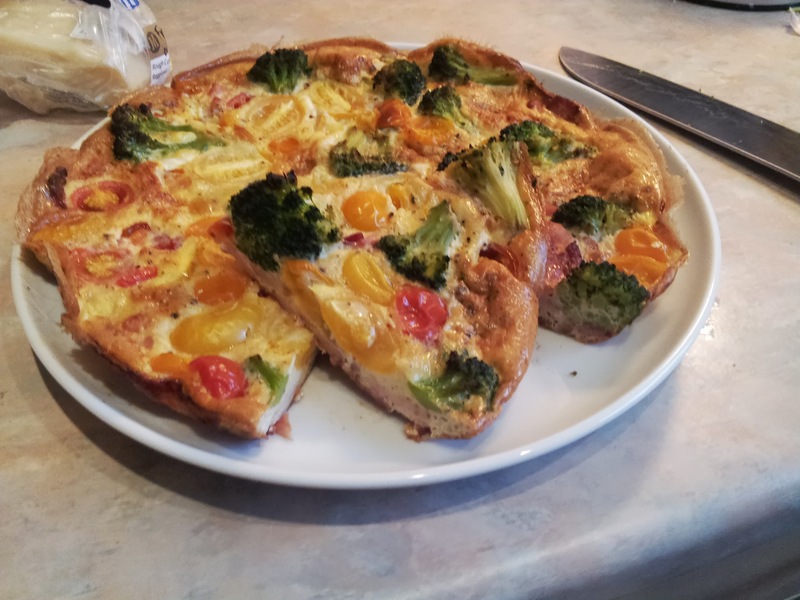 However they also work fantastically well as a pizza base, so topped with roast chicken, smoked bacon and a splash of spinach to convince you it’s a balanced meal you have a superb pizza. A fraction of the cost and I can have it ready before the guy on the moped arrives. Get the oven on as hot as you can. Pop the halved tomatoes in a baking tray and shove them in while you get on with everything else. Get a frying pan over a medium heat and fry the bacon for a couple of minutes, tossing occasionally until starting to colour (you will finish them off in the oven). Tip the bacon on to some kitchen roll to drain and add the tinned tomatoes, turning the heat up high. Add a dash of vinegar along with a pinch of salt and sugar and allow it to bubble furiously for 4 – 5 minutes until the mixture is thick and gloopy. Tip this into a sieve over a bowl and mash well to squeeze all the juice out (you can discard the pulp). Lay the naan on the baking tray and smooth over the tomato sauce. Top with the meats, cheese and spinach and pop in the hot oven for 7 – 8 minutes until the spinach has wilted and the cheese melted. Take the pizza and the tomatoes out of the oven and dot the surface of the pizzas with the now-concentrated tomatoes. 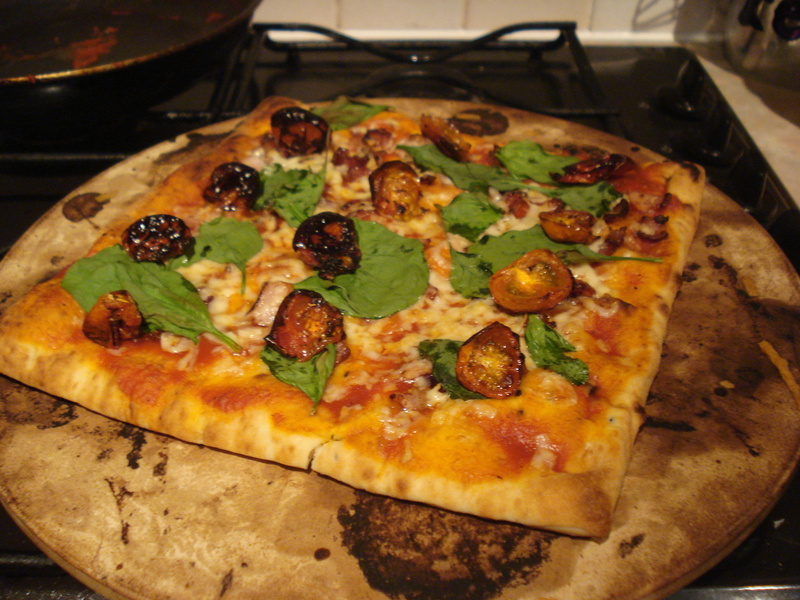 This entry was posted in bacon, chicken, food, pizza, spinach, tomato on September 26, 2012 by Gary.